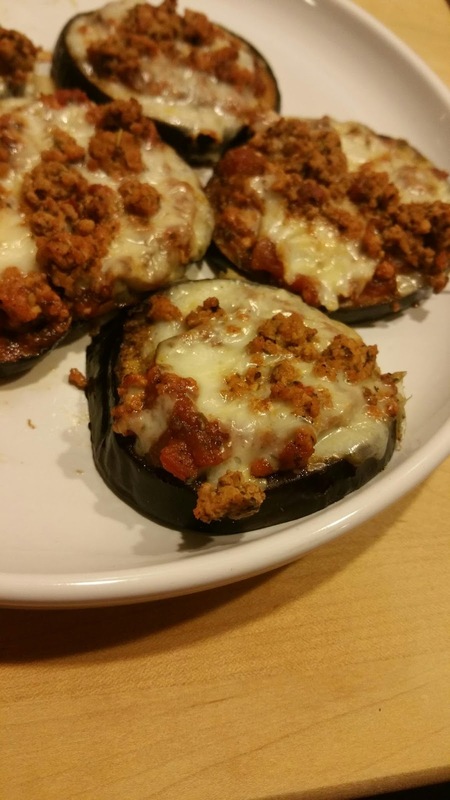 These eggplant pizza bites are a great way to get the kids some extra veggies in the form of something we all know and love – PIZZA! 1. Cut the eggplant in slices about 3/4 inch thick. 2. Lay the eggplant slices on paper towels and salt generously to draw out the water. This removes excess water. This is crucial to the recipe. 3. While the eggplant sits, make the sauce. Start by cooking a generous amount of garlic in olive oil. 4. Then add fresh diced tomatoes, Italian seasoning, and oregano. 5. Let sauce simmer, adding a tablespoon or two of water whenever it seems dry. 6. While sauce is simmering, brown 1/2 lb of extra lean ground turkey. 7. Once browned, drain any excess liquid and add half of the turkey to the sauce. 8. After 30 minutes, blot eggplant dry with paper towels & wipe off excess salt. 9. Brush the eggplant with oil, sprinkle with dried herbs, and roast at 375F/190C for about 25 minutes. 10. Then divide the sauce mixture among the eggplant pieces, top with the cheese then top with ground turkey. 11. Put pizzas under the broiler just until the cheese is melted and serve warm. These are easy to store, reheat and even freeze so what isn't finished doesn't go to waste!